GGMM C300 earbuds can compatible with Apple iPhone, iPad, iPod, Android phone, Huawei, Samsung, Sony, Nokia, MP3, MP4 and all 3.5mm jack devices. 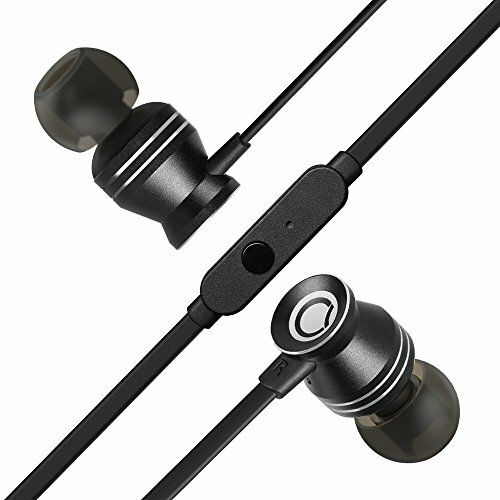 Earbuds with microphone double drivers design enhances your music with high-fidelity audio for better sound. 4 sets of hybrid silicone ear tips provide long lasting comfort, you? ?¡ê¡èll get a custom, comfortable fit that won? ?¡ê¡èt slip out. Wired earbuds carefully selected TPE material built durable & tangle free cables, so you can get caught up in your music, not your cord. 3.5mm gold plated jack provides a stronger sound connection without leakage. Natural Sound Quality & Noise Isolating: GGMM wired headphones in ear design combined with the correct ear tips will seal your music in and leave the external noise out and delivers natural clear and super enhanced bass sound. Durable Earbuds: GGMM durable wired earbuds chooses aircraft grade aluminium for housings, CNC processing technology, compact light weight design make it the perfect choice when exercising, traveling, or enjoying music during your daily. Package includes 3 extra sets of ear tips from small, medium, to large for a perfect fit. Wide Compatible Earphones: GGMM sport earbuds' 3.5mm Jack plug 100% fits most Smart Phones, Tablets, PC, Music Player,Laptop, other devices with 3.5mm port. What You Gets: GGMM Black earphones with microphone* 1, replaceable ear tips(S/M/L)* 4, user manual* 1, travel pouch*1, 1 year warranty and get 1 year extra free by registering on website, 1 * warranty card and 7/24 hrs friendly customer service. If you have any questions about this product by GGMM, contact us by completing and submitting the form below. If you are looking for a specif part number, please include it with your message.